As a wedding officiant, I am often one of the last professionals a couple calls when planning their wedding. This always surprises me because by choosing an officiant last, couples are often limiting their options for what they can do with their ceremony. 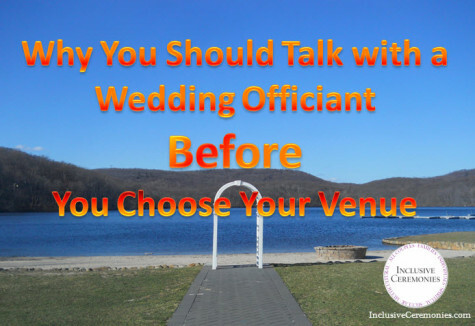 When you talk with a wedding officiant before choosing your venue, you can look at your venue with a critical eye for what you need for your ceremony and what you may want to avoid. Officiants know the venues and can help you avoid certain pitfalls. Here’s something you may not know about a lot of wedding venues—your wedding ceremony is not their main focus. Traditionally, it used to be that a couple would have their ceremony at a house of worship. Wedding venues were reception halls, focused on the catering end of the wedding day. Today, this is changing as more couples are having the wedding ceremony at the same place as the reception. To accommodate this change in trends, reception halls have had to create spaces for wedding ceremonies. At some venues, this was done with intention and forethought. These venues have adequate room for seating guests, power outlets for musicians and DJs, great lighting for photos, and rooms for couples and wedding parties to prepare before the ceremony. At other ceremony venues, the ceremony space is little more than an afterthought. I’ve seen some of the best and worst of many local venues. I know which venue doesn’t have any space for a wedding party to stand and which venue’s “chapel” is adjacent to an air conditioning unit so loud that you can’t hear yourself recite your vows. I can tell you which venue operators have gone the extra mile to help my couples have a fantastic ceremony and which venue’s coordinator preferred to let the ceremony take place outside, in the rain, rather than moving a few tables around inside. I can tell you if a venue is wonderful for a Saturday or Sunday wedding, but has a noisy happy hour on Friday evenings. 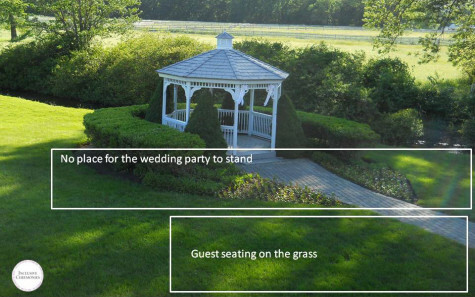 Wouldn’t this be handy information to have when choosing a place for your wedding? Talk with a wedding officiant BEFORE choosing your venue to avoid problems with your ceremony site. Officiants can tell you what to look for in a venue. How do you know what you need in a ceremony space if you haven’t planned the details of your ceremony yet? If you want to get creative with your wedding ceremony, or if you have some special requirements, you’ll benefit from a consultation with your celebrant before choosing your venue. There have been many times when I’ve met with a couple to plan their ceremony and we’ve come up with wonderful ideas, only to find out later that the venue couldn’t accommodate them. Sometimes it’s something big, like arranging the chairs in a circle or spiral around the altar area. Sometimes it’s something you might not think would be restricted, like the use of sand, rose petals, or candles during the ceremony. If you can walk into a venue with an outline of your ceremony and maybe even a sketch of the setup, you’ll be better prepared to evaluate a ceremony space and you’ll know what questions to ask. Talk with a wedding officiant BEFORE choosing your venue so you can got to venues with a clear picture of your ceremony plans. 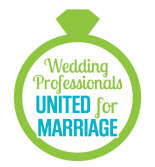 How can we hire an officiant if we don’t have a wedding date yet? It’s true that planning a wedding is a juggling act. Your wedding date is probably going to be determined—at least in part—by the availability of the venue you choose. 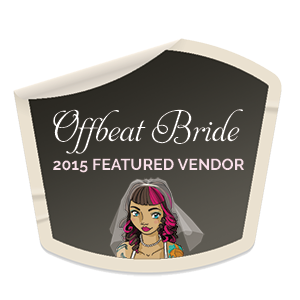 So how do you hire an officiant if you don’t yet have a venue? Consider beginning with a consultation. Some celebrants, like myself, are willing to consult with you in advance. A typical consultation might include an in-depth discussion of what you and your fiance want for your wedding ceremony, including processional planning, possible rituals, and other ceremony elements. After the consultation, you’ll have an outline of your ceremony and an idea of what you want to look for in a ceremony location. Depending on your planning timeline, you may be able to secure first right of refusal for a tentative wedding date with the celebrant. If you end up hiring the celebrant for your wedding, they may roll part of the consultation fee into the overall fee for their wedding services. 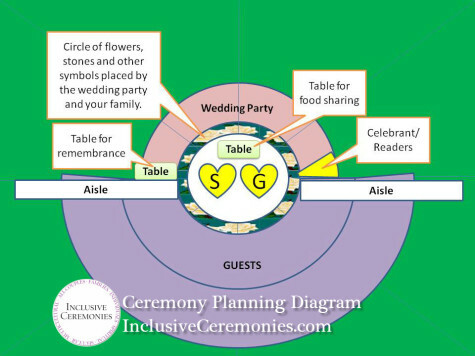 Or, you can use your ceremony outline as a starting point with another officiant. Either way, the consulting celebrant may be able to recommend another officiant to you. Just today I was contacted by a groom. Their venue is booked. The wedding is just a few months from now. But the groom is not happy with their very inexpensive officiant. While there is time to find a replacement, there’s no room left in the budget to invest in their ceremony. This is not a position you want to find yourself in. This happens more often than you’d think and I always feel bad about it. Wedding magazines mislead couples into thinking that the wedding ceremony should be one of the least expensive items in the budget. This may have been true in the past when most weddings were traditional, religious ceremonies with minimal personalization and were covered by church fees. 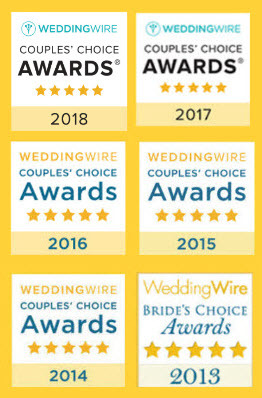 But times have changed and many wedding officiants (especially certified Life-Cycle Celebrants like myself) are trained professionals, offering custom-designed ceremonies and traveling to the venue of your choice. As with the quality of the other parts of your wedding day, it’s a case of you get what you pay for. By talking to your wedding officiant as early in the process as possible you can be prepared to budget for the ceremony you want rather than settling later for the ceremony you can afford with what’s left of your wedding budget. Your wedding ceremony is the symbolic start of your marriage and the centerpiece of your wedding day. Don’t let it be an afterthought. Consider working with an officiant early to take advantage of their experience and expertise in making sure that the location you choose for your ceremony fits your ceremony plans. Talk to Cris about your wedding ceremony today! Good advice, Rev. Paul. And if you already have some idea of what your ceremony will be like, it’s good to talk to the event manager to see if they can accommodate you, before you book the venue. Do you want or need candles or some other open flame in your ceremony? Were you planning a sand ceremony or planting? (I interviewed a museum when I was looking for locations for my ceremony and they didn’t allow sand or open flames.) Do you want a special seating arrangement? Do you need room for a chuppah or other wedding canopy? These are the details that can make or break your ceremony and some venues won’t be a good fit. It’s best to know in advance. Thank you for your article about why it’s important to talk with a wedding officiant before choosing a venue. I like how you pointed out that most wedding venues, per se, are not focused on weddings in particular. I’d prefer that the venue for my wedding will be a place where facilitating weddings is the main objective. I see how a wedding officiant can help with this. It’s good to know that a wedding officiant has knowledge of the best venues to have a wedding at. I’ll be sure to follow your advice and talk to a wedding officiant first.